If you want an easy light brunch that will wow your friends and family, look no more! This is the perfect solution to make them think you are a gourmet cook! It really is delicious and impresses everyone. Make sure you tell them how to make a healthy version of this is too! If this tart doesn't shout all the goodness of summer, nothing does. This tart is baked with a delicious cream egg mixture and filled with the taste of summer vegetables. Perfect for breakfast, brunch or dinner. 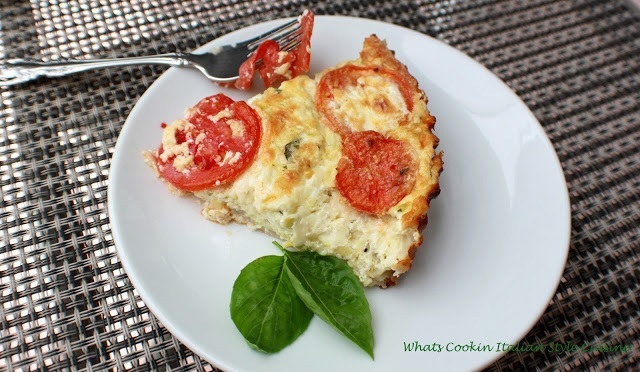 If you love cheese, mozzarella that is used in this tart is a mild taste. You can substitute cheddar, provolone, or any easy melting cheese you like. I really love to sprinkle a little Romano cheese on top of the tomatoes and then drizzle them with olive oil before baking. If you are watching carbs, then substitute crushed pork rinds for the bread crumbs. During the hotter months, this is the perfect light meal solution. Add a little house salad to this and you have a whole meal. Of Course you can add cooked meats to your tart if you like. I prefer it all vegetarian. If your family prefer meats, I recommend only using cooked meats. Cooked bacon, Italian sausages cut up and ham are the best choices. One of my favorite parts of summer is when zucchini is in abundance. I never have enough recipes to use it all up so I freeze it. Maybe you remember my tips on Zucchini post? You can find it here. Optional additions or substitutions: sliced ​​mushroom, sliced ​​eggplant, sliced ​​onions, chopped broccoli, chopped spinach, broccoli rabe or cauliflower can be used instead or mixed to 2 cups of vegetables medley. You can make the basic recipe and use any of the above listed. Preheat oven to 375 degree. Grease the tart pan and line with dough. Place the zucchini in a medium sized bowl adding all ingredient except tomatoes and blend all together. Pour into the tart pan. 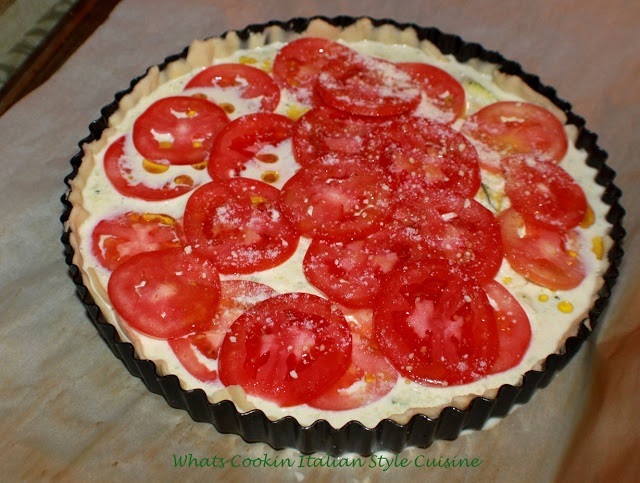 Place sliced ​​tomatoes on top If using add the bread crumbs on top of the tomatoes. Add more Parmesan, drizzle with olive oil. Salt, pepper and granulated garlic just on the tomatoes for flavor. Bake tart until the middle is set at 375 degrees around 45 minutes to 1 hour . 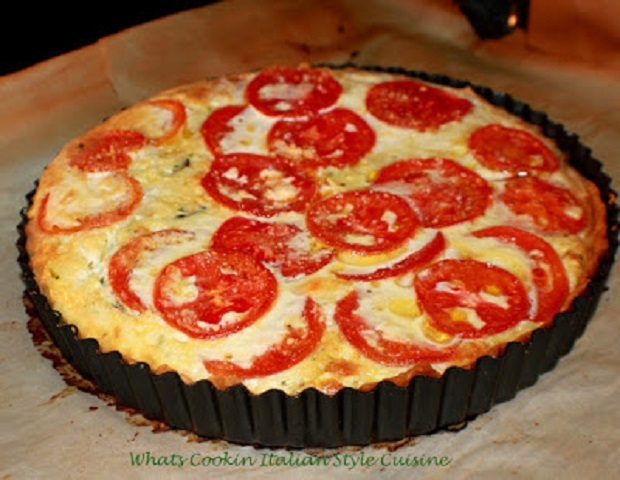 This savoury tart looks fantastic! I loove this Zucchini tart. It certainly gave me an idea on how to use my Zucchini. I am not a fan of cheese, so I will revise it and skip the cheese on mine and I will add ground chicken . When you hear tart you always think sweet but not savory this recipe using zucchini is a genius idea, like a pie but nicer. I bet it is so good! This is perfect for brunch or dinner. Add a side salad, or some chicken wings and you have a meal. Perfect way to use all that fresh zucchini. This made me think of frittatas, which my hubby loves for me to make. He likes zucchini, I'm not sure if he's ever had a tart made of one. 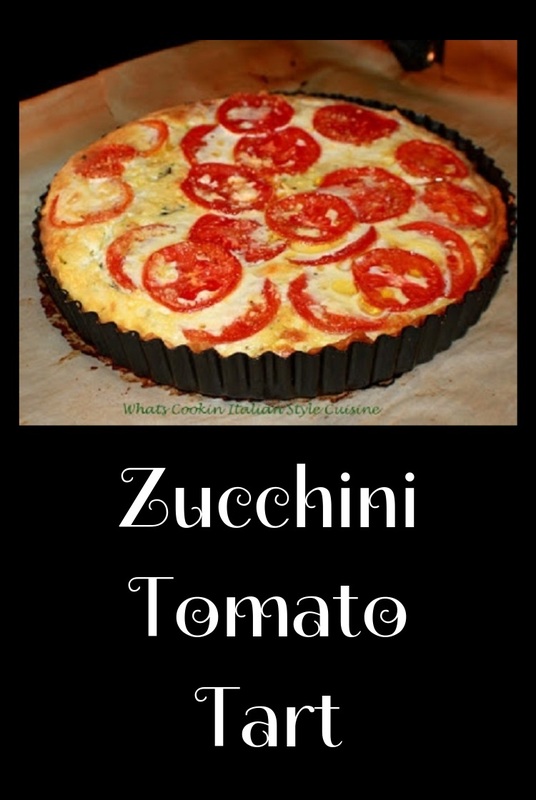 You can never have enough of Zucchini or tomato recipes. I love the sound of this one. Tarts a big hit in our home. Kids love it and veggies go down easy. Gotta try this soon. Frankly I this tart would be perfect anytime. I'm such a fan of all things egg. Be it a tart, omelet, quiche, or eggs Benedict. I don't need meat in the tart to satisfy me. This would be perfect as is. This zucchini start looks delicious. this is ultimate summer tart. I would love eat every day.